You no longer need an excuse to drink Champagne, over are those days of waiting for a wedding, a birthday or New Year. Its officially good for your health to drink Champagne one to three times a week. So pop that cork and glug down that prescribed medicine. A study from the University of Reading claims that drinking a few glasses of champagne in a week could help prevent memory loss and even degenerative brain disorders like dementia. The downside is that your head should be so clear you won’t forget how many glasses you’ve drunk (unless you’ve got to about four, and open another bottle). So here’s the science: the researchers found that phenolic compounds in champagne support proteins linked to storing memories and ultimately improve your spatial memory. These proteins diminish as you age, but champagne was shown to slow that process and delay or prevent cognitive issues associated with getting old, according to the release. The study points to two red grapes used in the production of champagne, Pinot Noir and Pinot Meunier, as the source of the phenolic compounds. It may be great for your head but it might not be so good for your pocket, unless with all that added brain function you figure out ways to overcome that, probably. 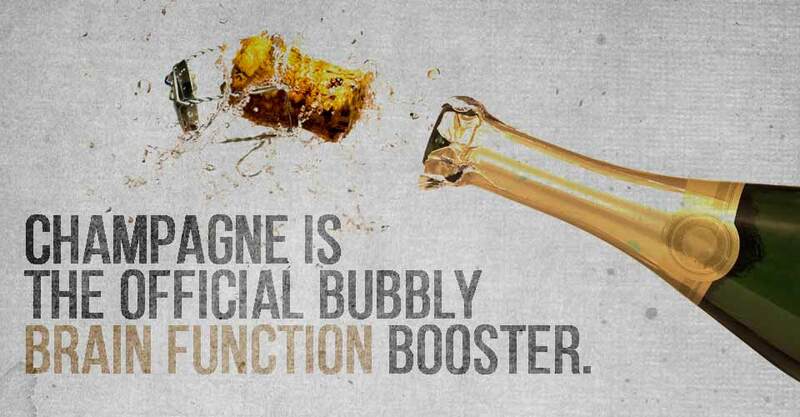 Either way, here’s a toast to the bubbly brain booster!